"Very nice modern apartment with fantastic viewsfrom terasses...amazing city, amazing apartment for romantic vacation!! One of the best location in Valencia for your stay." "We have been renting apartments all over Europe for the past 10 years and can honoustly say, this was the most enjoyable experience!Thelocation is great, on a quiet little square in the old center. The apartment itself was wonderfull.Good size for 2, or 3.Beautifully furnished, exceptionately well equiped with all apliances you need. And very clean! 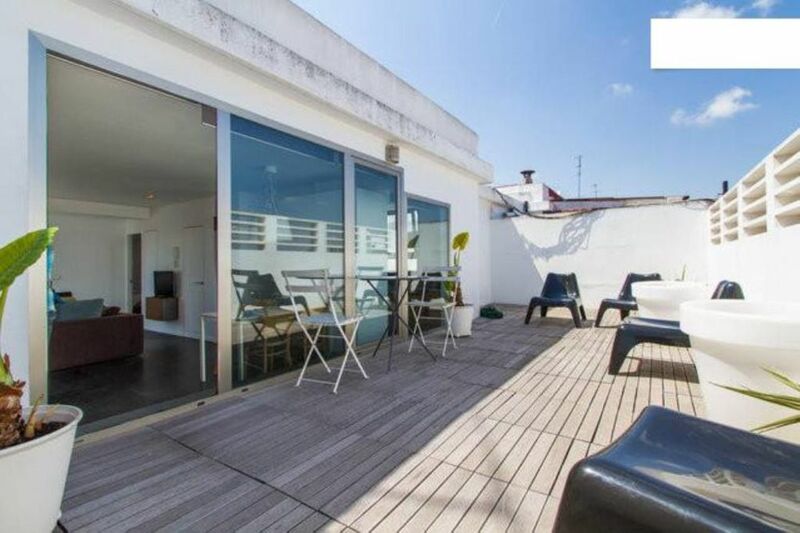 2 great terrasses overlooking the city as the icing on the cake. And to top it off, the owner Victor is a great guy.For the price we paid, we thought it a great deal. Highly recommended." "This is a wonderful apartment in a very central location. All the furniture is clean and comfortable. We loved the decks on both sides of the apartment. Victor was extremely helpful and always prompt with emails. We loved the apartment and hope to return someday." "The apartment is well located, stylish and comfortable. Its two terraces are ideal for soaking up the morning sun or sipping wine and watching the sunset over the roofs of Valencia. It is perfect for a long weekend retreat." Tolle Lage - sehr gute Ausstattung!!! From the airport, take the underground (both lines green and red) till the station “xativa”. Then take ne bus number “ 5 interior” and at the 5 th stop go down. Then take the street Pintor zariñena and you will arrive to Plaza vicente iborra. If you stop at “angel guimera “ station, then go to guillem de castro and look for the bus stop, take number “5 interior” and at the 3th stop go down. Then take the street Pintor zariñena and you will arrive to Plaza vicente iborra. the best restaurants, pubs, shops, cultural sites, all at hand. tarifas decrecientes en función de la duración, tarifa en función del número de personas, suplemento para la calefacción según la estación, fianza pedida, arras/deposito de reserva, entrega de llaves realizada por propietario, ausente durante la estancia.